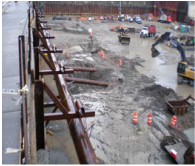 NTH conducted SUE, utility condition assessment, utility coordination, lead paint and asbestos testing, bridge footing and strut locating, geotechnical investigations, and retaining wall design, helping MDOT achieve project success. NTH was retained to conduct environmental investigations, prepare permit applications, provide design engineering services, provide construction contract administration and construction materials testing. 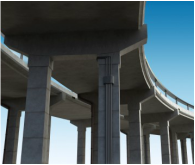 NTH was retained to collect relevant geotechnical data and evaluate conceptual designs for a cable-stayed bridge, suspension bridge, or tunnel. NTH was contracted by a major city in Ohio to review documents and site conditions related to construction activities for the convention center and damage to the adjacent city street. ​NTH performed an evaluation of the existing parking lots at two schools to determine whether the pavement could be rehabilitated for Berkley School District (BSD). The Michigan Department of Transportation retained a team of experts, including professionals from NTH Consultants to perform bridge scoping services on the I-75 Rouge River bridge deck.